With hearings to determine the fate of Keystone XL happening right now, pipeline fighters gathered in Nebraska this weekend to stand up for our climate, communities, and human rights. 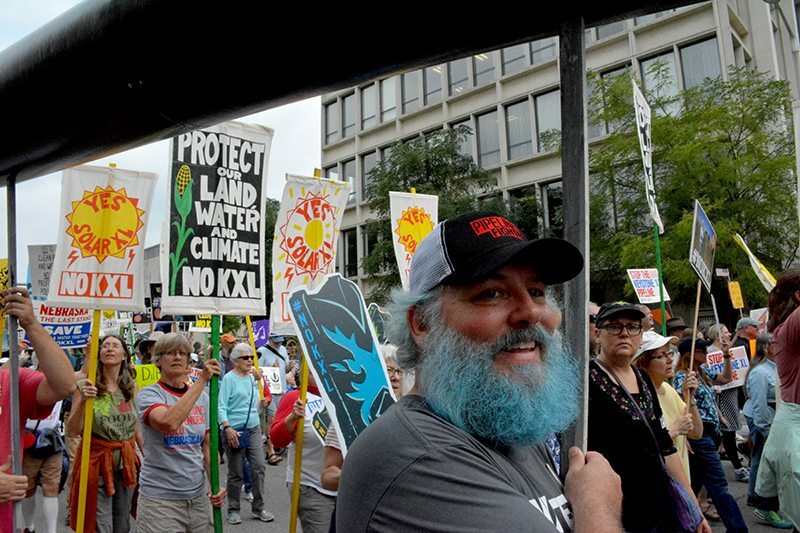 Greenpeace volunteer leader Ryan Trundle (pictured) traveled from Louisiana to show solidarity with communities in the path of the Keystone XL pipeline. Photo by Isabelle Geczy / Greenpeace. When Manape LaMere asked this question to a crowd of more than 600 folks in front of the Nebraska Capitol Building in Lincoln, he was met with heavy silence. After a beat, someone called out “bad!” through the quiet, but the question hung in the air. His question underscores a key element of the renewed fight against the Keystone XL pipeline. 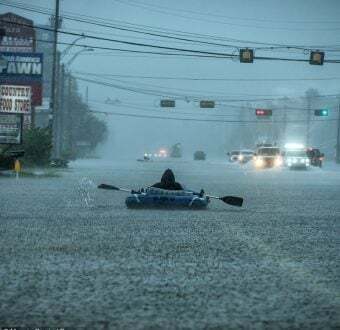 This project represents a lethal combination of greed, capitalism, and colonialism, and for the sake of climate and the communities in its path it must be stopped. This past Sunday, I joined Indigenous activists, farmers, ranchers, landowners, and concerned citizens facing pipelines in their communities to march against Keystone XL. Called the “March to Give KXL the Boot,” the event was held the day before a round of hearings — which are currently underway — kicked off in the Nebraska capital. The hearings and subsequent decision by the Nebraska Public Service Commission (PSC) will either confirm or deny TransCanada’s right to construct the pipeline through Indigenous sacred grounds, farms and ranches, and precious water sources. Keystone XL, like all tar sands oil pipelines, poses a serious threat to water resources that millions rely on, both directly and indirectly. In fact, the three companies that want to build new tar sands pipelines — including the Keystone XL — have seen a total of 373 spills since 2010, releasing more than 63,000 barrels of various hazardous liquids into the environment. Spirits throughout the march and rally were upbeat. This was by no means the first protest against the pipeline in Lincoln — this coalition has been fighting Keystone XL for almost a decade. But determination to protect their homes, livelihoods, sovereignty, and clean air and water continue to motivate the pipeline fighters. For those who couldn’t be on the ground with us in Lincoln, here’s what you missed. The march was led by Indigenous youth on horseback (quite literally, as they were out at the front of the crowd leading the way), Nebraskan farmers and ranchers, and First Nations Peoples. As you may have guessed from the name of the march, there were plenty of boots! From signs featuring illustrated boots, to the large boot on wheels that rolled through the streets, to the custom shoes Bold Nebraska Founder Jane Kleeb had created with the pipeline on the soles (so she could march over it with every step) giving KXL the boot was the order of the day. Signs were waived as strangers became friends, and the march moved through the avenues of downtown Lincoln. Greenpeace is proud to stand in solidarity with so many allies and partners fighting the advance of this dangerous pipeline. From the hearing rooms in Nebraska, to the powerful ground resistance popping up around the world, to the banks financing these pipelines, we will continue to use the power of protest to stop pipelines that threaten our air, water, climate, and human rights. 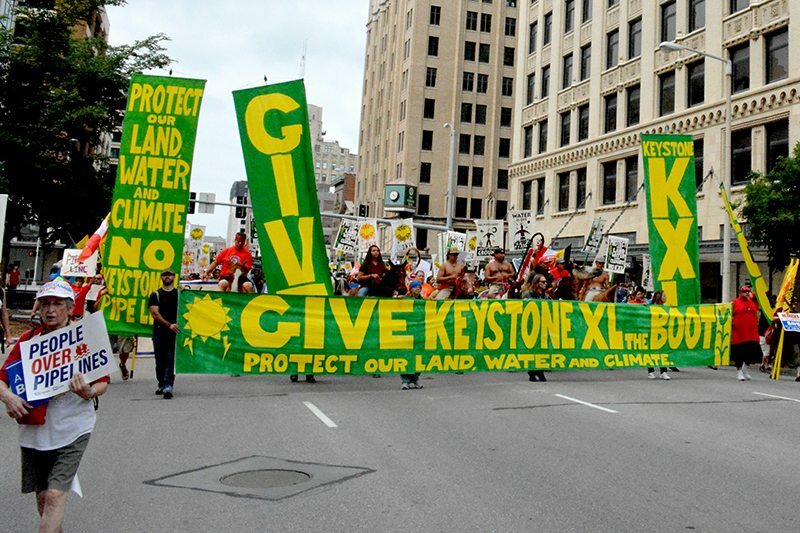 Here’s how you can join the fight to stop Keystone XL right now. For the next week, people on the frontlines of this fight will be testifying and sharing their stories in hearings before the Nebraska Public Service Commission. Outside of the hearings, we can also do our part to stop Keystone XL by putting the big banks that bankroll these pipelines on notice — starting with JPMorgan Chase. As one of the world’s largest banks — and one that has publicly supported action on climate change in the past — JPMorgan Chase has a responsibility to pull its support from this dangerous pipeline. Take action to tell JPMorgan Chase to defund all tar sands oil pipelines at the link below! 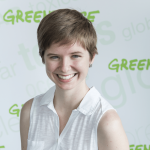 Isabelle is a National Mobilization Organizer with Greenpeace USA, based in San Francisco. She works with activists around the country, getting them connected with opportunities to take action. Defending our environment from industry and destruction, speaking out against injustice, and finding strength and resilience within our communities gives her hope. When she's not out organizing, Isabelle can usually be found with her nose in book.